Oh, joy! What an exciting week this has been! 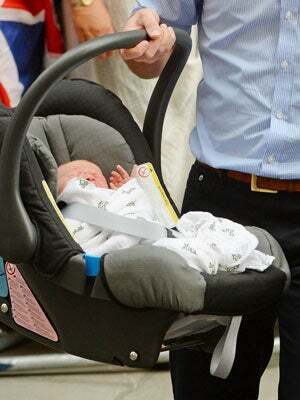 First, the royal baby was born. Then, he emerged from the hospital. And now, He hath been given a name! Imagine! Though the Duke and Duchess of Cambridge said yesterday they hadn't officially decided on a name, Kate and William have now announced that the little bundle of joy will go by Prince George Alexander Louis. All of this was floating around in various rumor mills on the Internet, so probably, more than a few people are winning some kind of bet right now. There have been six King Georges in the past, including the one who preceded the current Queen Elizabeth. Remember The King's Speech? That was a George (though his real name was Albert). So, maybe, this little guy will be played by Colin Firth's son in a movie someday. We'd watch that, for sure. Meanwhile, best wishes to the royal family — we're sure there's some unbearable cuteness going on right now!